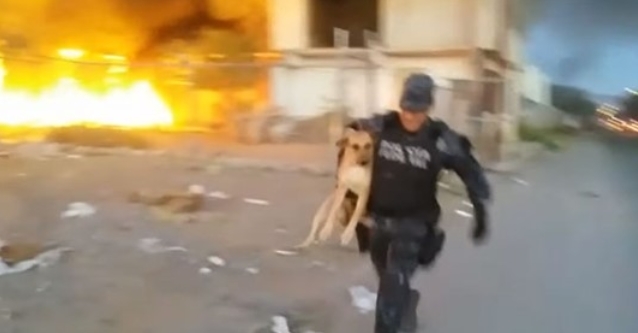 A Federal police officer from Mexico risked his life in a dangerous fire to protect and save the life of a mixed breed dog named Lulu. The pet almost perished in the uncontrollable blaze, but thanks to the unnamed hero officer, the dog is safe. When the fire broke out, area residents feared for their own lives. The flames engulfed the property and it threatened to set other nearby residences on fire. Lulu, who probably worked as a security dog for the property, was trapped inside the complex. A metal privacy fence surrounded the building and all exits were locked with metal chains. Locals feared jumping the fence and putting their own lives at risk. Not only were they scared of getting trapped in the fire, but they also feared Lulu would attack or become aggressive towards anyone trying to save her. Luckily federal officers where in the area and jumped to saved the dog. The metal chains were cut and an officer rushed into the complex to retrieve Lulu. The dog tried to run to safety and sought refuge on the furthest point along the fence far away from the flames. The pet was petrified and instead of becoming aggressive towards the officer, she welcomed the rescuer who pulled her to safety. 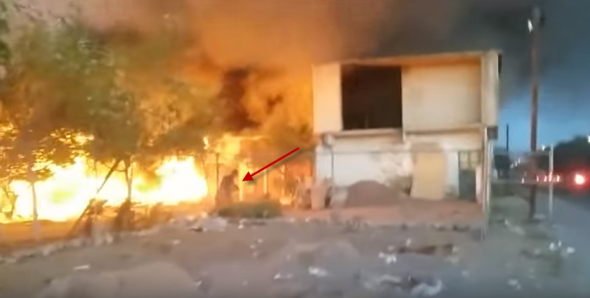 Responses to "Policeman Saves Dog About to Die in Uncontrollable Fire"
Love this officer. And those others who helped. Our men in blue, again, risk their own lives to save a life. God bless you.